1.1 How to incorporate texture into your own design? With the different kinds of design and techniques available, it is sometimes very difficult to choose which one will suit your art piece. This is the reason why graphic designers always try to familiarize themselves with the processes and available resources that will improve their designs. If you’re looking to add more tone and feel in your designs, perhaps convey a certain nostalgia, then try adding texture. Of course, you can never go wrong with the silver texture. How to incorporate texture into your own design? Texture is one of the many popular techniques that graphic designers master in order to create a compelling and realistic design. It is defined as the surface quality or the feel of the object. When your design has texture, whatever it is, be it silver texture or marble, the people looking at them will have an idea of how it “feels” and will, more or less, understand the message that lies in your design. Natural textures are popular in posters that aim to evoke an organic feel. It can either be a grassy texture, or silver texture that with the imagery of stars or heavenly bodies. When you implement natural textures to your design, it brings about vividness, and warmth resulting to a beautiful piece. Create compelling posters by setting a contrast between your natural textured backgrounds and choosing a striking foreground. Then try to achieve a balance by carefully incorporating a suitable textured background to a striking foreground with deep colors. Artificial texture is different compared to natural textures because they are made up of different surreal patterns and human-fabricated objects. Examples of artificial texture include washed-out textile, wall surfaces such as marble texture, crumpled paper, and three dimensional designs. Silver texture can be part of artificial texture if it is being featured as a metallic design, which is mostly used to symbolize technology or robotics. Graphic designers can also use photographs as textures to create a more beautiful or personalized designs. Making use of photographs will not only give you good graphics, but it will also create identity to your art. Most graphic designers opt to use paper texture in modern design. It provides a solution in creating compelling visuals for minimalist designs. Another thing that makes paper texture great is that it is suitable in various colors. 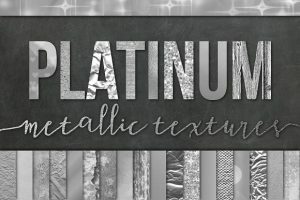 You can achieve a silver texture using this design if you simply adjust the color, opacity, depth, and the transparency. Establish layers with three-dimensional textures. This way, you can create a more lifelike design with three-dimensional layers by combining opacity and transparency adjustments to make a difference on the appearance of the design. Then you can use a silver texture to achieve that artificial intelligence effect and create a robotic feel by incorporating a three dimensional layer adjustment. 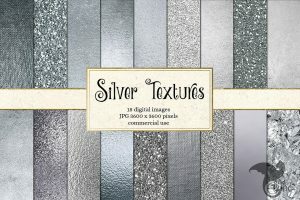 This is a set of 18 silver digital papers, texture, and backgrounds. If you noticed, this type of silver texture is suitable for invitations to both formal and casual events. This set is available for $4. 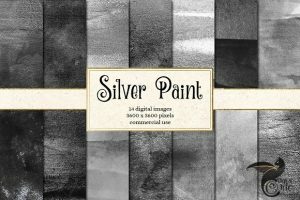 This is a pack of 14 silver watercolor digital papers, textures and backgrounds and is available for $4. This set can be used as backgrounds for card, stationery, and posters. And it is also enticing if you have a matte finish to these textures. Add a touch of glitter with this gold and silver texture to your art. Then you’ll notice that the glitter borders gradually fade away into transparent finish in the middle making these frames perfect for overlays on invitations, cards, and other paper goods or products. 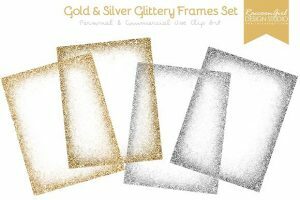 This is a set of 2 gold and 2 silver texture frames as is available for $3. This is a set of five 8 by 8 inch digital paper textures. Thinking of organizing a stargazing event? You can use these textures for the invitation. How about an evening event for your company? This set is also suitable for any paper product or goods that you can use – programme printout? Name tags? Choose the right color of fonts, and this is provides the perfect finish. This set is available for $4. From the creator’s description, “I was seeing foil designs all over the web which I loved, BUT it looked like they all came from the exact same texture. So I set out to make a metallic collection of every texture imaginable, all in glorious, shimmering silver bling!” This set includes different silver textures – 5 textured foil, 4 crumpled foil, 4 shiny foil, 3 bokeh, 3 stone, 2 glitter, 2 gradient, 2 satin, 1 silk, 1 canvas, and 1 wood. These are all great for projects such as cards, art prints, invitations, stationery, paper goods such as paper bags, boxes, and even gift wrappers. For a price of $8, you will get this whole set. Such a good bargain! 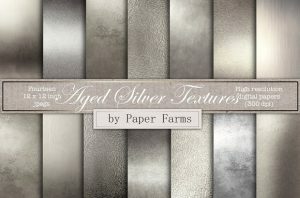 This is a collection of antique silver backgrounds. If includes fourteen 12 by 12 inch jpegs in 300 dpi. The texture can be of different use. For paper projects such as letter set, this provides an elegant and ladylike touch. This set is also suitable for gift wrappers, especially for gifts given during weddings or silver wedding anniversaries. The set can also be used for themed invitations, and posters. You can do a lot for the price of only $5. Silver texture are the way to go if you want a casual yet elegant feel of your product or art design. 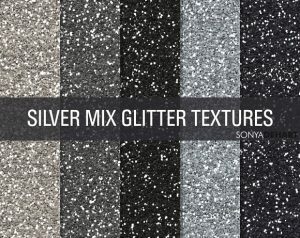 You can check out website for more silver texture options and start creating! So what are you waiting for? Need more tips, tools, and tricks for your designs? Then get in touch with us.